Une équipe de scientifiques et techniciens travaillant dans le domaine du développement de semiconducteurs optiques ont fondé en 2003 la sglux GmbH. En étroite coopération avec des instituts de recherche et en partenariat avec le client, leur travail est inspiré et motivé par le souhait de transférer les innovations scientifiques au marché des composants de mesures UV. Veuillez trouver ci-dessous une liste des projets actuels et finalisés. 2016-2020 - Investigation of UV-Aging behavior of components used in the production of UV-LEDs and UV-Sensors. Within the UV-Aging project experimental setups and scientific method are developed to allow a reliable estimation of the degradation behavior of LED and photodiodes as well as components used in these products (glass, diffusors, reflectors, glues, etc.). In the beginning a UV-Aging chamber will be constructed which allows the control of UV light (UV-A, B & C), temperature (up to 170°C) and humidity (95% r.h.). This project aims at the development of optics, electronics and software for miniaturized SiC UV spectrometers and camera modules. sglux as the first company worldwide is working on a new product family of Silicon Carbide (SiC) based UV spectrometers (up to 1024 pixel resolution). The advantage of such UV spectrometers results from the extreme radiation hardness and very high visible blindness of SiC compared with Silicon (Si) based UV spectrometers leading to negligible degradation and zero stray light effects caused by visible light. This new spectrometer technology allows precise UV spectrometry also at presence of strong visible light such as UV measurements in the bright sun (e.g. UV Index spectroscopy) or under room light. Another advantage of the SiC UV spectrometer results from the high radiation hardness and low dark current of this material. These features lead to a broader dynamic range of the spectrometer compared with conventional Si based spectrometers. Spectrometers with a 128 pixel resolution are available for evaluation purpose. Measurement and calibration facilities and calibration methods for high UV irradiation will be established within this project. These methods will accord to the calibration procedures of the Physikalisch-Technische Bundesanstalt (PTB) and will allow sglux to offer novel industry-based calibration services. Hereby the project is focussing on the UV curing industry. Based on results of a corporate BMWi ZIM project, reference radiometers and standard sources with high UV irradiation will be optimized for this application field. The UV-Index according to ISO 17166 is a measure of the risk of sunburn (erythema solare) at a given solar irradiance. Governmental meteorological institutes measure the UV-Index with spectroradiometers. Due to high investment and maintenance costs of these spectroradiometers, the use of small, rugged and low maintenance UV-Index-Radiometers should be a matter of evaluation, in particular when meteorological networks are planned to be extended. To evaluate the performance these UV-Index-Radiometers, basically the measurement uncertainty needs to be investigated and compared with the measurement uncertainty obtained by spectroradiometers. 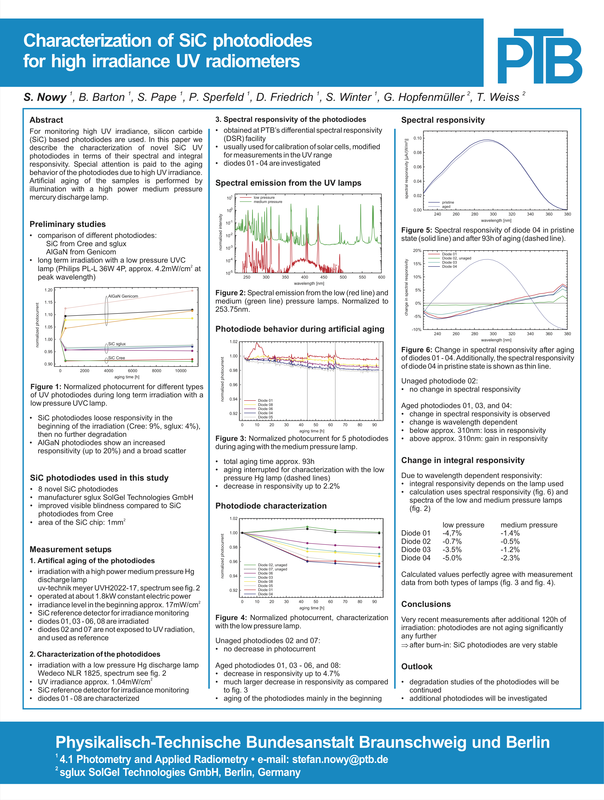 Egli et al.¹ report the typical UV-Index-spectrometer measurement uncertainty with ± 5 %. To investigate the measurement uncertainty of UV- Index-Radiometers, a bundle of 2073 different sun spectra with a range from UVI 0.5 until UVI 13.5 was used. They were traceably obtained at different places at the earth where the solar situation was influenced by latitude, altitude, season and daytime. Using the formula reported by ISO 17166 the UV-Index was calculated for each of the different sun spectra. Subsequently spectral responsivity curve of seven different UV-Index-Radiometers (manufactured by sglux GmbH) was integrated with the 2073 different sun spectra (according to ISO 17166) and in total 14,511 different UV-Indices were calculated. The differences of spectral responsivity of the seven candidates result from inevitable production tolerances of the UV-Index-Radiometers. These 14,511 different UV-Indices obtained by the UV-Index- Radiometer were compared with the related UV-Indices calculated by the formula stated in ISO 17166. As a result we could demonstrate that the spectral responsivity variance of the seven different UV-Index-Radiometers did not result a measurable influence on the measurement uncertainty. However, we saw an influence caused by the different sun spectra. In particular at extremely low UV-Indices of below 0.5 the measurement uncertainty increased. We saw that this measurement uncertainty follows a definable rule which allowed us to develop a gain matrix programmable into the radiometer’s firmware. After applying of this matrix the measurement uncertainty could be reduced down to ± 5 %, also for extremely low UV-Index values. Accordingly, the study shows that the measurement uncertainty of the sglux UV-Index- radiometers is at the same level as reported from UV-Index-spectroradiometers. This result encourages to expand the investigation into the area of the UV-Index-Radiometers field of view (FOV). The ISO 17166 standard claims a FOV close to the cosine curve. If this FOV investigation would also result good results compared with UV-Index-Spectrometers one may regard the UV-Index-Radiometers as a reliable completion or even substitution of the spectroradiometers. This would create new opportunities to measure the UV-Index in regions where skilled personnel needed to maintain the spectroradiometers is not available. Before starting this project no laboratory worldwide performed traceable calibration chains for mobile UV reference radiometers. Our work aimed at a scientific evaluation and completion of UV calibration chains realizing a PTB traceability. This goal was reached by systematic evaluation, improvement and completion of an existing measurement method. As a result we now present as the first laboratory worldwide a traceable calibration chain in the ultraviolet region. This new method will be applied by the members of the “advanced UV for life” project where the method serves to determine properties of the new products planned (mainly UV LED) by means of a traceable measurement. Furthermore, this new method will by applied by sglux to determine the properties of own products and products of third parties by means of calibration service. A 128 pixel SiC UV spectrometer with a wavelength resolution of 2.3nm/pixel was development. The advantage of such kind of UV spectrometers result from the extreme radiation hardness and very high visible blindness of SiC compared with Si based UV spectrometers leading to zero stray light effects caused by visible light. This new spectrometer technology allows precise UV spectrometry in the presence of strong visible light such as UV measurements in the bright sun or under room light. Another advantage of the SiC based UV spectrometer results from the high radiation hardness and low dark current of this material. This features lead to a broader dynamic range of the spectrometer compared with conventional Si based spectrometers. Metrologia, issue 51 (2014), S. 282-288. For monitoring high UV irradiance, silicon carbide (SiC) based photodiodes are used. This project characterized novel SiC UV photodiodes in terms of their spectral and integral responsivity. Special attention was paid to the aging behavior of the photodiodes due to high UV irradiance. Artificial aging of the samples were performed by illumination with a high power medium pressure mercury discharge lamp. After burn in no degradation could be measured. A detailed study of different properties of UV diffusers was performed. Diffusers are essential components of UV radiometers used as transfer standards. They improve the insensitivity to differing radiation situations. Highly efficient polytype 4H silicon carbide (4H-SiC) p–n diodes for ultraviolet (UV) light detection have been fabricated, characterized, and exposed to high-intensity mercury lamp irradiation (up to 17 mW/cm²). The behavior of the photocurrent response under UV light irradiation using a low-pressure mercury UV-C lamp (4 mW/cm²) and a medium-pressure mercury discharge lamp (17 mW/cm²) has been studied. Long-term UV photoaging tests had been performed for up to 22 months. Results demonstrate the robustness of SiC photodiodes against UV radiation. The devices under test showed an initial burn-in effect, i.e., the photocurrent response dropped by less than 5% within the first 40 h of artificial UV aging. Such burn-in effect under UV stress was also observed for previously available polytype 6H silicon carbide (6H–SiC) p–n photodetectors. After burn-in, no measurable degradation has been detected, which makes the devices excellent candidates for high irradiance UV detector applications. Electronic and photoelectrical properties of semiconducting titanium dioxide layers had been investigated and improved.